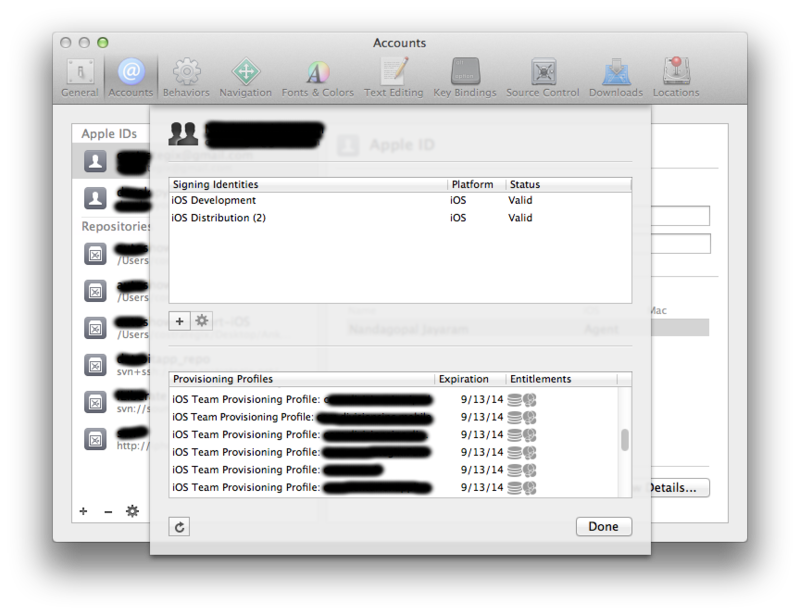 In Xcode 5, I can get list of provisioning profiles under Xcode >> preferences >> accounts >> view details. I want to copy profile and have to send it to one of my client, but I am not able to right click on it to find it using "Reveal Profile in Finder" option. How can I get specific provisioning profile in XCode 5 or do I have to download it from developer.apple every time? I found a way to find out how your provisioning profile is named. Select the profile that you want in the code sign section in the build settings, then open the selection view again and click on "other" at the bottom. Then occur a view with the naming of the current selected provisioning profile. to dump each certificate. The line after the second commonName in the output will be the key name e.g. "iPhone Developer: Joe Bloggs (ABCD1234X)". xCode 6 allows you to right click on the provisioning profile under account -> detail (the screen shot you have there) & shows a popup "show in finder". you can scan the directory using awk. This one-liner will find the first file that contains the name starting with "iOS Team". Here's a script that also returns the first match, but is easier to work with. 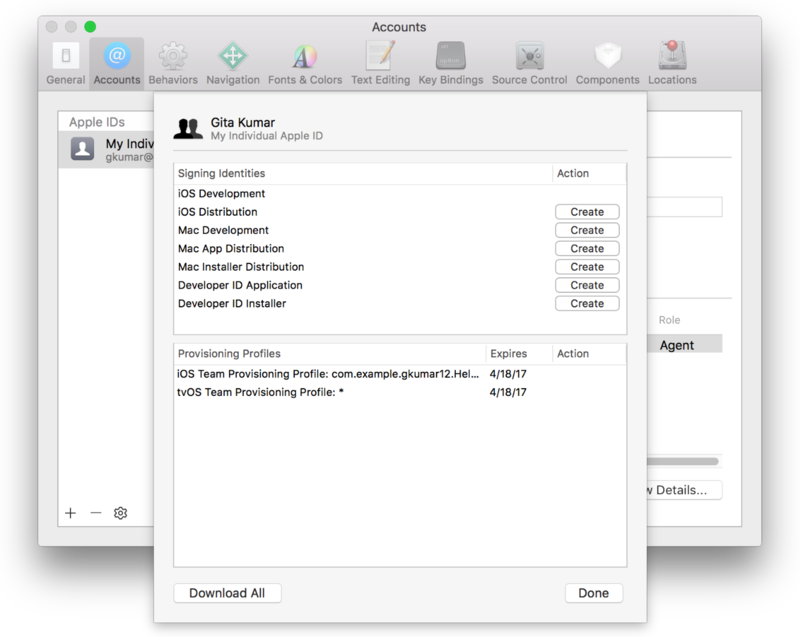 You can use "iPhone Configuration Utility" to manage provisioning profiles. echo -e "\nUsage: $0 <myprovision>\n"
echo -e "\nFile not found: $1\n"
Click Accounts at the top of the window. Select the team you want to view, and click View Details. 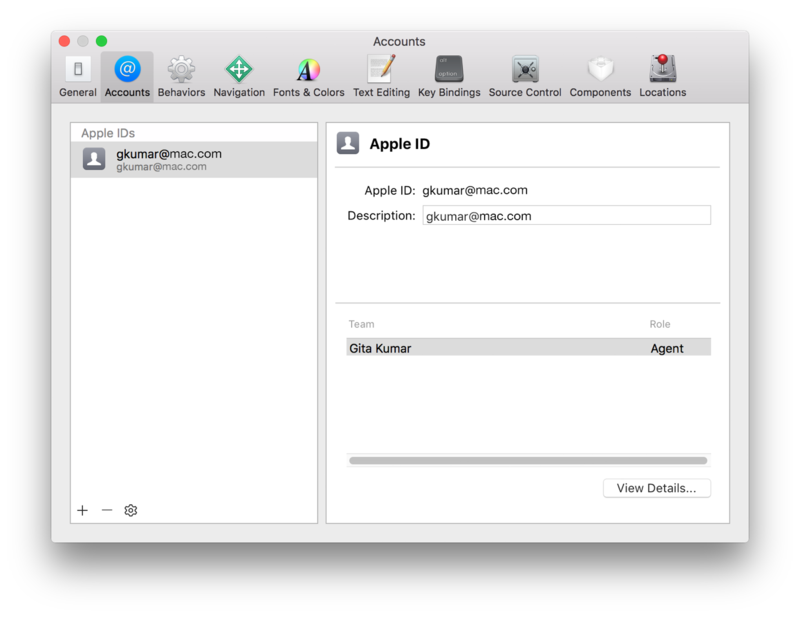 In the dialog that appears, view your signing identities and provisioning profiles. If a Create button appears next to a certificate, it hasn’t been created yet. If a Download button appears next to a provisioning profile, it’s not on your Mac. Ten you can start context menu on each profile and click "Show in Finder" or "Move to Trash". Not the answer you're looking for? Browse other questions tagged xcode provisioning-profile xcode5 or ask your own question. Xcode 7 how do you refresh provisioning profiles?